In many ways Andrew Wheating’s story is a fairy tale of sorts. He was an avid soccer player at Kimball Union Academy in Meriden, NH and running was the furthest thing from his mind. In fact, besides the soccer try-out mile, he couldn’t imagine why anyone would ever want to run. His sophomore year during that soccer try–out mile he clocked a 5:30. His junior year he dropped it to 5:00 but he didn’t make the team. He was devastated. The soccer coach told him, “You should consider running cross country because we could be sitting on Olympic stuff here.” So he did. He ran well, finishing at times over a minute ahead of his competitors. He wasn’t hooked on running. He was pretty good at it but he didn’t love it. In the spring of his junior year the school’s spanish teacher showed him the film “Without Limits” a story about the life and untimely death of distance legend Steve Prefontaine. He was immediately hooked on running and vowed he would go to the University of Oregon to run, however he wasn’t exactly the type of athlete Oregon typically recruited. Kimball didn’t have a track team so he hadn’t even run a track season yet. Then he was introduced to legendary coach Jeff Johnson and everything changed. Johnson taught Andrew about running. That fall under Johnson’s direction he won the D4 New England Private School Championship and the USATF Junior Olympic XC Championships. Lucky for Wheating, Johnson, who was essentially Nike’s first employee, was close friends with Oregon head coach Vin Lananna. At the time Johnson called Lananna, Wheating had only run a 4:12 1500, hardly a time to put a prep on his recruiting radar. Johnson told him there was something special here so Lananna said he would do him a “favor” and fly Wheating out for a visit. By the end of his first track season he had run 3:54.28 for the 1500 and was allowed to “walk-on” the team at Oregon. At Oregon he quickly improved. He ran 1:50 for the 800 by the end of his frosh track campaign. During his sophomore indoor season he started running even faster and for the first time realized what is was like to feel good in a race. At NCAA’s he split 1:47 in the DMR. He really got to know his body and developed more and more confidence. In outdoor track he finished second at NCAA’s and qualified for the Olympic Trials……and he just started running track two years prior at Kimball!! At the OT’s he took each round as a singular race and kept advancing all the way to the finals. The morning of the race he was doing some 200’s with his assistant coach Andy Powell looking on. Afterwards Powell said, “You look like you’re floating out here” in which Wheating responded, “I feel like I’m floating out here.” Later that night the TV commentator would yell into his microphone, “Andrew Wheating with the unthinkable!”, after his stunning finishing kick that garnered him second place and a spot on the U.S. Olympic Team. It was one of the most memorable OT races of all time. Wheating started writing history after that. His senior year at the 2010 NCAA Championships he was the first athlete to win both the 800 and 1500 since fellow Duck Joaquim Cruz did it 26 years earlier in 1984. Later that summer in Monaco he would post the 2nd fastest 1500 ever by an American born athlete running 3:30.90. Only Alan Webb, the US record holder in the mile, had run faster. As of 2018 only four American citizens have run faster: Bernard Lagat, Sydney Maree, Alan Webb and Matt Centrowitz. 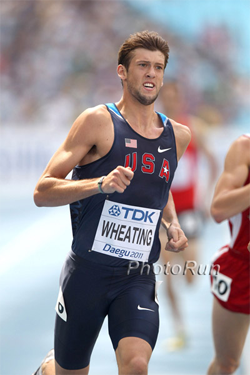 In 2012 he made his second Olympic team, this time in the 1500 meter run. Andrew graduated from Oregon with a degree in sociology and continued to reside in Eugene where he trained and raced for the Oregon Track Club Elite. On January 4, 2018 he announced his retirement from professional running. Currently, he’s working with the Portland Track Group to help improve the sport by creating an internet show called Tracklandia that centers around displaying the interests and hobbies of elite athletes. In addition, he coaches at Madison High School in Portland, OR and travels the country telling his story.